Day 10 was a grey day. Winds during the day were 14-16 knots. We were 750 miles from Santa Barbara. 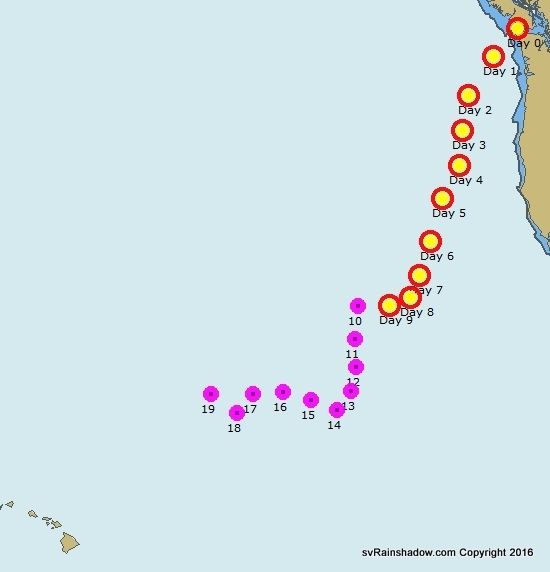 Peter advised us to run south to avoid the doldrums of the Pacific High to our west. We sailed as far downwind as we could, flying the Genoa, full Main and Mizzen Stays’l. While Eric was at the helm, the stays’l sheet parted due to chafe on a stay. The stays’l flogged horribly and in the mayhem, we nearly did a 360. Eventually Van and Eric wrestled the sail back aboard and it appeared undamaged. All is well that ends well. We traveled only around 100 nm – the wind was light (14-18 knots), as is to be expected in the Horse Latitudes. Day 11 brought us showers – that is the body washing type, not rain. First showers since Neah Bay and we were all happier for it. We also got warning from Peter that we must hold a 200 True course, running about 90 miles/day to get into position ahead of dissipating Hurricane Blas. He wants us to use the remnants of this tropical storm to get a kick westward. In the present wind direction, the only way we can sail 200T is if we fly the spinnaker. Marilyn was voted the most likely to succeed, so she ‘enjoyed’ 4 1/2 hours at the helm carefully keeping the sail filled in the light 7-14 knot apparent wind. Overnight we flew the genoa and main, and the Monitor wind van did a fabulous job. Overall it was a good day. We travel another 100 NM. Day 12 – We are now down to about 30 N, where squalls are supposed to start, and right on schedule they do in the early morning hours. With all the unsettled weather about, Peter revised our goal to keep ahead of Tropical Storm Blas. Wind was shifty, we’re tired and full of indecision about which sails to raise. We eventually settled on Drifter and Mizzen Stays’l, which we changed to Genoa and full Main for overnight. On my sunset watch, I saw an orange glow on the horizon which was a mystery – a boat? I decided it must be a UFO – what other plausible explanation could there be? But then the next night I saw it materialize again as the moon setting. Mystery solved, for me at least. We travelled about 90 NM this day. Day 13 – Overnight we each watched during our respective shifts a building thunderstorm squall that eventually approached our path during Van’s 0200-0400 watch. It was sucking us into it with 25 knot sustained winds, gusting 30. Having no interest in getting sucked into a thunderstorm, we hove-to for about an hour. After the situation improved, we set off again flying the Genoa and Main on a port broad reach with true wind speeds of 15-17. In the afternoon, we raised the Mizzen Stays’l to have better speed through the waves. We started seeing some larger, somewhat better behaved swells. We all hoped this meant we were approaching the trade winds. We had a beautiful evening and the stars were out early. Felt hopeful that things would improve. Traveled about 115 NM. 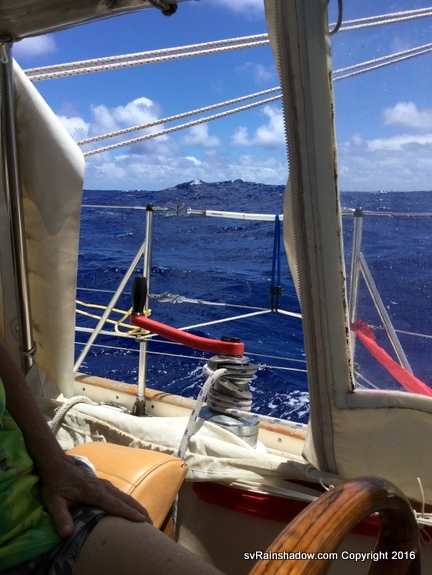 Day 14 – we gybed to a starboard tack at dawn. There were squalls all around with rough confused seas and 22-25 knot winds. We decided to sail with double-reefed main and 4 wraps on Genoa. We really should have put up the working jib, but the conditions were too rough and Van was too tired to do this difficult sail change on the furler. Things improved later in the day, and we felt better until Peter warned us that Hurricane Celia is due to hit the Big Island about the same time as we might, so he advised us to linger at about 25N to stay out of her way. Another bad thing–the dodgy handhold on the coach roof gave way as Eric was using it. He was tossed across the cockpit and bashed his rib against the combing. Broken ribs, or maybe just cracked – not good. He’s brave and tough as can be, and never complains about it again, though I frequently see him wince. We traveled about 115 NM this day, but some of it on a NW heading. We are over 1100 NM off the US west coast, and a straight line distance of about 1100 NM to Hilo. Of course, we won’t be able to travel in a straight line to Hilo due to all the tropical storms and hurricanes. Day 15 – again started with sequential squalls, requiring us to reef and unreef the roller-furling genoa many times. The main remained double-reefed. The sea state was rotten. Gusts to 30 knots. Finally about 1300, the sea state improved and big rollers returned as we transitioned into a different ocean current. The afternoon was sunny, hot and humid. The water temperature reached 69 degrees. By dusk, we were again surrounded by squalls, sustained 25-28 knot winds with gusts to 33. Sea state was horrible. Exhaustion overcomes our motivation, and Van and Marilyn decide its best to hove-to on a port tack with double-reefed main and 8 wraps on the genoa. We stay hove-to for about 6 hours overnight, which drive us SE. We travel about 130 NM, making about 60 NM progress towards Hilo. Day 16 – In the early hours, Marilyn and Van slept with the comfort of knowing we were hove-to and safe, but Eric isn’t familiar with this heavy weather tactic and couldn’t sleep due to the erratic motion and the wind howling in the rigging. Fortunately, dawn brings less confused seas, with winds down to 20-24 knots. We decided to set sail again about 0600 because Peter warned us that we have Hurricane Blas on our tail. By afternoon it was actually pleasant with organized seas and a stable 20 knot wind. The Monitor wind vane was doing a superb job steering. Both Eric and Van got sprayed by a boarding wave and had a good laugh, which was very nice to hear because it’s been tense and serious for days. Lurking hurricanes will do that to crew morale. 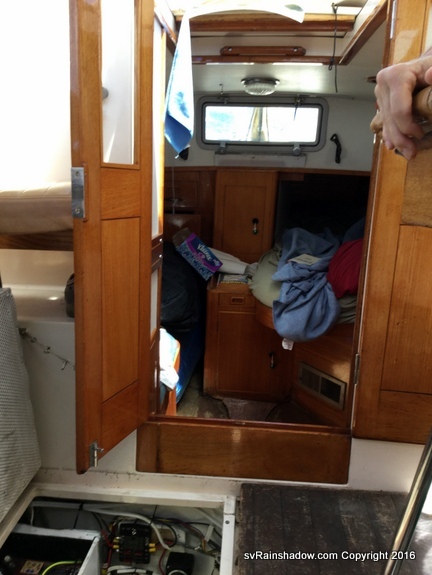 But some not so good things occurred too – Marilyn began to suspect there may be a problem with the solar charger, and Van decided the outboard motor mount on the stern rail is about to fail so he lashed the outboard motor to the aft deck. After dusk, Van saw an orange glow on the horizon and convinced Eric it was a boat. They started to discuss taking evasive maneuvers until Marilyn reminded them it’s the same orange glow she thought was a UFO but determined was the setting moon. We all had another good laugh about each of us being fooled by the moon. We travel about 150 NM, but in a wiggly course making about 65 NM progress towards Hilo. Day 17 – Squalls overnight, which we mostly avoided but got stuck in the backside “death warmed over” no-wind section of one that passed us after dawn. So we furled the headsail and motored to charge the batteries, which gave us more evidence that the solar charger was not working right because the batteries sucked amps from the alternator for a whole hour. By mid morning, the wind returned to 18-20 knots so we jibbed, and then noticed we got advice from Peter to “run as fast as you can to Hilo” in an effort to beat the next approaching hurricane (Celia). We we did our best to go fast, but less than 24 hours later Peter was further convinced we are not racers. We travel about 130 NM this day, knocking about 100 NM off the distance to Hilo. Day 18 – At daybreak, we noticed the foot tape was coming off the Genoa because the stitching had failed. We also definitively learned the solar charger was not working right. Bad news comes in threes – Peter informed us we were not going fast enough to beat Celia to Hilo and we had to let her pass first. All three bits of bad news required action, and we did our best to pick off the tasks in the correct priority. First, Van and Eric wrestled the Genoa to the deck and hoisted the working jib again. The wind was in the 18-20 knot range, so this was a good sail change anyway. Then Van debugged the solar charger problem and learned it could not be fixed while underway (though still uncertain of the cause). Finally, we were so hesitant to turn away from Hilo that Peter had to read us the riot act to get us to jibe. Fortunately the early evening was beautiful – good wind and seas with a bright moon. We needed a boost of sailing magic after such a long day. We travelled about 150 NM this day on a wiggly course, knocking about 80 NM off our distance from Hilo. Day 19 – We had no squalls overnight – amazing. We did have a few rain clouds pass over and steal our wind. One of those times, we decided to furl the jib and start the motor but once all that work was done, the wind was back and we had to undo all the work and reset the Monitor windvane. Patience is definitely a virtual when at sea. Otherwise the wind was reasonable all day, 16-20 knots. We had showers again (body showers, that is). Weatherfax continued to show tropical storms and hurricanes south of us, and it became clear that Hurricane Darby was our next threat once Celia passed. We decided to hove-to for the night and get some sleep. Hurricanes lurking about made us nervous, adding to our exhaustion. Our log suggested we traveled about 160 NM this day, but only made about 40 NM towards Hilo. We are about 740 NM from Hilo by this time and very tired. Saga to be continued in Part III. Once below 30N, we had warm weather, sometimes had blue skies and almost always had big messed-up waves.